PAGE UNDER CONSTRUCTION – RESEARCH ONGOING! When did the name ‘Parcan’ arrive? Manufacturers found a number of different names for the lantern containing a PAR64 lamp. 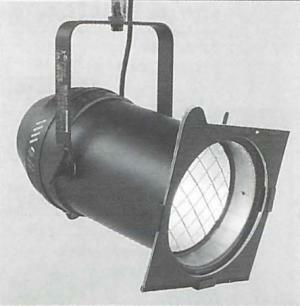 In 1985, the product type was referred to as Beamlight in CCT catalogues. ‘Parcan’ was not mentioned. However, in Francis Reid’s ‘The Stage Lighting Handbook’, second edition in 1982, ‘Par Cans‘ (two words) are referred to frequently as a ‘recent development’. When were PAR 64 lamps first used? R (for Reflector) lamps pre-dated the PAR (Parabolic Aluminised Reflector) lamps, and were made of a lighter-weight, less weatherproof and less rugged glass. 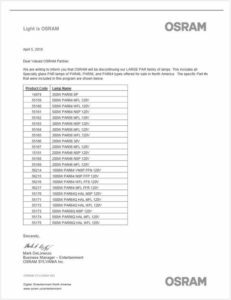 A Eurolite PARcan history document states that the PAR lamps were introduced in the USA in the 1950s. A contributor to the ControlBooth forum thinks that the PAR64 was invented by Charlie Altman for the 1964 New York Worlds Fair. Bellman’s ‘Lighting the Stage: Art and Practice‘ (1967) refers to Type R (reflector) lamps, and also the more rugged PAR lamps, which were originally designed for outdoor architectural lighting, and are constructed with a heavy pyrex glass envelope ‘that is capable of taking the stresses that may occur when the hot lamp is doused by rain or a carelessly directed garden hose’. One source, in Cue magazine, states that Brian Croft of ESP introduced the PAR lamp to the UK in 1968. Other sources are being investigated. More information can be found on ControlBooth. In 1977, Strand in the UK were calling a lantern containing a PAR 64 lamp a ‘Parblazer‘. In the US, Strand Century were calling them ‘Par Holders‘. In 1977 also, James Thomas Engineering started manufacturing spun aluminium PAR64 lanterns. In TABS Vol.35 Issue 1 (1977), the fact is mentioned that 240V versions of the PAR 64 lamp are not yet available. By TABS Vol.36 Issue 3 (1978), the Parblazer had been modified (now Parblazer 2) to incorporate the new 240V PAR 64 lamp. By 1981, Strand were on Parblazer 4. The term “Parcan” is in common use by 1987 (Stage Lighting Handbook (3rd Ed. ), Francis Reid) and probably much earlier – research is ongoing. 1968: 110V PAR lamp introduced to the UK, according to article in Cue magazine. This seems very early. 1977: Strand introduced the Parblazer, using 110V lamps in series. James Thomas Engineering began producing spun aluminium PAR64 lanterns. 1978/79: Van Halen world tour travelled with 1000 parcans, which led Showco to think about alternatives, leading to the Vari*Lite moving light. 2019: Osram announce they’re ceasing production of the 120V PAR lamp range (USA) due to manufacturing problems (letter below).